Enhancing the governance of social-ecological systems for more equitable and sustainable development is hindered by inadequate knowledge about how different social groups and communities rely on natural resources. We used openly accessible national survey data to develop a metric of overall dependence on natural resources. These data contain information about households’ sources of water, energy, building materials and food. We used these data in combination with Bayesian learning to model observed patterns of dependence using demographic variables that included: gender of household head, household size, income, house ownership, formality status of settlement, population density, and in-migration rate to the area. We show that a small number of factors—in particular population density and informality of settlements—can explain a significant amount of the observed variation with regards to the use of natural resources. 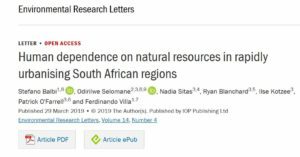 Subsequently, we test the validity of these predictions using alternative, open access data in the eThekwini and Cape Town metropolitan areas of South Africa. We discuss the advantages of using a selection of predictors which could be supplied through remotely sensed and open access data, in terms of opportunities and challenges to produce meaningful results in data-poor areas. With data availability being a common limiting factor in modelling and monitoring exercises, access to inexpensive, up-to-date and free to use data can significantly improve how we monitor progress towards sustainability targets. A small selection of openly accessible demographic variables can predict household’s dependence on local natural resources.